At least 25% of patients with breast cancer develop skeletal metastases, with bone the site of disease producing the greatest morbidity. It is apparent that the bisphosphonates present an important component of the treatment strategy. They are now the treatment of choice in tumour-induced hypercalcaemia, and they can reduce bone pain and skeletal complications such as pathological fractures. In addition, bisphosphonates are being increasingly evaluated in the prevention of bone metastases and to prevent and treat cancer therapy-induced osteoporosis. Ongoing research is aimed at trying to define the optimum route, dose, schedule and type of bisphosphonate. At least 25% of patients with breast cancer develop skeletal metastases, with bone the site of disease producing the greatest morbidity. Skeletal complications include hypercalcaemia, pathological fracture, bone pain requiring radiotherapy, and spinal cord or nerve root compression. Randomised trials in advanced breast cancer have shown that one of these major events occurs, on average, every 3–4 months [1, 2]. The average life expectancy from diagnosis of bone metastases is 2 years, with up to 20% of patients surviving 5 years. There is thus a real need for treatment to reduce skeletal complications and to improve the quality of life in these individuals. Bone is not an inert organ; normal bone undergoes a continuous process of resorption and formation. Recent research has begun to shed new light on the development of bone metastases, as well as on the continual interaction between cancer cells and active bone. Tumour cells in the bone marrow cavity secrete a variety of paracrine factors that stimulate bone formation. Of key importance is the stimulation of osteoclast function. This results in osteolysis, which is typically associated with disruption of the normal coupling signals that control the relative levels of osteoblast and osteoclast function. It is in this situation that bisphosphonates are able to offer their therapeutic potential in metastatic disease. These abnormalities in bone function are reflected in abnormal levels of serum and urinary collagen breakdown products, which may therefore be exploited as biochemical markers to monitor progress of the disease and the effectiveness of bisphosphonate therapy. The breast cancer patient with skeletal metastases now has a much improved range of management options, including radiotherapy and radiopharmaceuticals, orthopaedic surgery and systemic anticancer therapy with cytotoxic and endocrine therapy . Nevertheless, it is now apparent that the bisphosphonates present an important additional treatment strategy that can reduce both the symptoms and complications of bone metastases. All bisphosphonates contain a phosphorus–carbon–phosphorus central structure that promotes their binding to the bone matrix, and variable side chains that determine the specific effects on bone cells. Although a large number of candidate compounds are potentially available, and there is continuing interest in the development of new compounds, a relatively small number of bisphosphonates have so far been introduced into routine clinical use in oncology practice. Clodronate (usually given by mouth) and pamidronate (by intravenous infusion) are the two drugs most commonly prescribed for oncological indications. It is known that less than 5% of the dose of oral clodronate is absorbed (Fig. 1)  and this leads to problems in compliance (taking the size and number of capsules required to maintain a therapeutic dose). A significant proportion of patients also experience gastrointestinal toxicity, which is more common than with intravenous preparations. Infusion of pamidronate typically takes 1–2 hours, placing additional demands on already overworked intravenous therapy units. 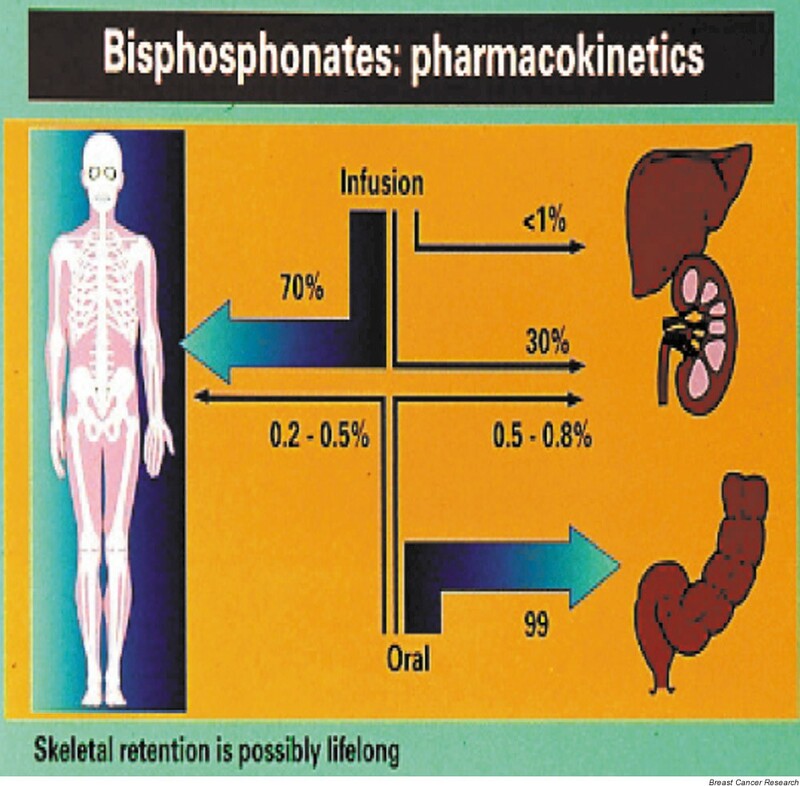 Pharmacokinetics of bisphosphonates showing the skeletal retention and poor oral availability of currently available compounds. Clinical trials with two relatively new bisphosphonates, zoledronic acid and ibandronate, suggest that they may soon find a place in routine therapy. Zoledronic acid, which is given intravenously, shows much greater potency than the earlier bisphosphonate drugs in vitro, and infusion times are dramatically reduced (15 min). Zoledronic acid has yielded impressive results in the treatment of hypercalcaemia and bone pain associated with bone metastases , and is at least as effective as pamidronate in the prevention of skeletal morbidity from breast cancer [5, 6]. Ibandronate is an amino-bisphosphonate that is also highly potent and is now licensed in Europe for the treatment of hypercalcaemia of malignancy. Ibandronate also appears to offer benefit in the treatment and prevention of osteoporosis, and in reduction in skeletal morbidity in metastatic bone disease . As well as the intravenous form, an oral preparation is being developed that appears to be well tolerated at a therapeutically useful dose . Hypercalcaemia is the most common metabolic complication of malignancy and it is important to recognise because it is associated with a range of unpleasant gastrointestinal and neurological side effects. Hypercalcaemia frequently responds well to treatment, at least in the short term, which can significantly improve a patient's quality of life. The pathophysiology depends on several factors including local osteolysis by tumour cells and more generalised osteolysis by humoral factors. Parathyroid hormone related protein levels are often raised in patients with hypercalcaemia and appear to have an important role in humoral hypercalcaemia of malignancy . Renal effects, including increased renal tubular reabsorption of calcium and impaired renal glomerular filtration, also contribute . Bisphosphonates, since their introduction, have revolutionised the treatment of hypercalcaemia, and an intravenous bisphosphonate together with rehydration is now the standard treatment of hypercalcaemia of malignancy. Generally, bisphosphonates need to be given intravenously to allow restoration of normocalcaemia, although clodronate can be given subcutaneously and this can be useful in the pallative care setting. Intravenous clodronate as a single infusion of 1500 mg can achieve normocalcaemia in 80% of patients . Similar studies with pamidronate given as a single infusion over 2–24 hours have shown that normocalcaemia can be achieved in up to 90% of patients . Newer and potentially more potent bisphosphonates such as zoledronic acid may be even more effective and, because of their shorter infusion time, may simplify treatment. A recent pooled analysis of two randomised, controlled trials compared intravenous zoledronic acid (doses of 8 and 4 mg) with pamidronate (90 mg) in hypercalcaemia of malignancy . After 10 days, both zoledronic acid arms of the trial showed a better complete response rate (8 mg, 88.4%; 4 mg, 86.7%) compared with the pamidronate arm (69.7%). The response duration was also better in the zoledronic acid arms of the trial (43 and 32 days) compared with the pamidronate arm (18 days). External beam radiotherapy remains the treatment of choice for many patients with well-localised bone pain, with excellent results achieved in most situations with a short treatment schedule of one to five fractions. However, patients often have widespread, poorly localised, non-mechanical pain, and other patients experience recurrent pain in previously irradiated sites. For this group of patients, bisphosphonates provide a useful alternative treatment option. Most experience with bisphosphonates for bone pain is from their use for skeletal metastases in advanced breast cancer, although the effects of bisphosphonates on pain seem to be independent of the nature of the underlying tumour or radiographic appearance of the metastases, with sclerotic lesions responding similarly to lytic metastases. Studies with the currently available oral bisphosphonates (at doses tested) have been disappointing; none have convincingly been shown to alleviate metastatic bone pain in a clinically significant manner [9, 10] in the absence of systemic anticancer therapy. To obtain a useful effect, the intravenous route is necessary at least until more potent oral formulations are available. Several studies using intravenous clodronate, ibandronate, pamidronate and zoledronic acid have all demonstrated useful pain relief with improvements in analgesia requirements and an improved quality of life [7, 9, 11]. A randomised, double-blind trial to evaluate the contribution of markers of bone resorption in patients with bone metastases was carried out by Vinholes et al. . Symptomatic decrease in bone pain was seen after administration of pamidronate but not placebo, and the response correlated well with a decrease in bone resorption markers, particularly Ntx (N-terminal telopeptide of type I collagen). It appeared to be necessary to normalise bone resorption markers to achieve optimal pain relief and this should be the aim of bisphosphonate therapy. Those individuals who had an initial level of bone resorption markers greater than twice the upper normal limit responded very poorly to pamidronate and this may have useful predictive value for therapy. Two recent studies have highlighted the apparent advantage of intravenous over oral bisphosphonates in pain reduction. A study by Diel et al. over a period of 2 years with 361 patients treated with oral clodronate, intravenous clodronate, or intravenous pamidronate showed the best pain reduction was achieved by intravenous therapy. In a study in our own centre, 51 patients with metastatic bone disease were randomly allocated to treatment with oral clodronate, intravenous clodronate followed by the same schedule of oral clodronate, or intravenous pamidronate. There was a significantly greater improvement in pain scores in the intravenous pamidronate arm of the trial, and this was reflected in an accompanying improvement in bone resorption markers . The optimum dose and choice of bisphosphonate may depend on the stage of the disease, and individual response in bone markers may play an increasingly important role in the future in tailoring treatment to the individual patient. There is now overwhelming evidence that bisphosphonate therapy reduces skeletal complications in breast cancer, such that it should now be considered part of standard cancer therapy. Data from some of the many clinical trials to assess the effects of bisphosphonates (particularly clodronate and pamidronate) on skeletal-related events are summarised in Table 1. SRE = skeletal related events; SMR = skeletal morbidity rate. Randomised trials comparing chemotherapy + pamidronate with chemotherapy + placebo were particularly striking, with a significant reduction in the mean number of skeletal related events per year in the pamidronate arm of the trials [14, 15]. Such trials also demonstrated that a reduction in skeletal morbidity began to be apparent after 3 months of treatment with bisphosphonates and was maintained throughout the study period. In addition, quality of life was maintained and a reduction in pain and analgesic use was observed compared with the placebo group. In one study by Hortobagyi et al. there was a significant reduction in the proportion of patients having any skeletal related events (43% versus 56%), a reduction in the number of non-vertebral pathological fractures (by 60%), and a reduction in the proportion of patients having radiation to bone (by 45%) or surgery on bone (by 52%). These trials led to the worldwide registration of pamidronate for treatment of metastatic breast cancer. A randomised, double-blind, dose-finding phase II study of zoledronic acid  has led to a phase III study using 4–8 mg for the treatment of osteolytic metastases, including breast cancer, the results of which are awaited. In patients with metastatic breast cancer, bisphosphonates have not yet shown any significant overall effects on patient survival, although subgroup analyses have suggested that young (<50 years) patients with breast cancer receiving chemotherapy may gain a small survival advantage [1, 16]. Recent research has focused on optimising the treatment parameters. Of particular importance is the need for trial evidence regarding the most appropriate time to initiate bisphosphonate treatment and its optimum duration. It would be extremely useful to be able to predict whether a particular patient is likely to respond to bisphosphonate treatment. It seems possible that biochemical markers of bone resorption may be useful in this respect, and there is evidence that patients who fail to normalise bone resorption markers experience a higher number of skeletal events. In one study of 21 patients with raised bone markers receiving pamidronate , 12 patients normalised the rate of bone resorption. The normalised group showed a significant reduction in progression of their skeletal metastases (P = 0.03), compared with the remaining nine patients whose bone resorption remained abnormal. In the group that normalised, there was also a reduction in fracture rate that approached, but did not reach, significance (P = 0.07) in this small study. There are now increasing numbers of long-term survivors who have received combination chemotherapy, radiotherapy and hormonal cancer treatment. Many of these individuals are at increased risk of osteoporosis, largely because of the endocrine changes induced by such therapy. This is a particularly important long-term problem in women with breast cancer for whom there are concerns about the safety of hormone replacement therapy. In such patients, bisphosphonates represent an effective alternative therapy both to prevent and to treat osteoporosis, and biphosphonates should be seriously considered particularly in those experiencing an early menopause . Since the release of growth factors and cytokines from resorbing bone are known to facilitate cancer cell growth and proliferation at the bone surface, the known effects of bisphosphonates in reducing bone resorption might be expected to inhibit initiation and progression of metastatic bone disease. After encouraging animal studies, several human trials have been carried out with the bisphosphonate clodronate. The clinical benefit is far from clear at present, however, due to apparently conflicting results. In a study of 1079 women with primary operable breast cancer, only 28 (5.2%) patients on clodronate developed definite bone metastases compared with 44 (8.1%) on placebo, with a mean follow-up of 4 years (P = 0.054) . Diel et al. studied a group of 302 primary breast cancer patients who had no overt evidence of metastatic disease but who had tumour cells in the bone marrow, a risk factor for development of distant metastases. Patients were randomly assigned to receive oral clodronate for 2 years (157 patients) or standard follow-up (145 patients). The median observation period was 36 months. The incidence of osseous metastases was significantly lower in the clodronate group (11 patients versus 25 patients; P < 0.002) and there was also an unexpected reduction in the incidence of visceral metastases in the clodronate group (19 patients versus 42 patients; P < 0.001). This potentially exciting finding must, however, be viewed in the light of a further trial that suggested quite the reverse. Saarto et al. randomised a group of 299 women with primary node-positive breast cancer to clodronate (149 patients) and to control (150 patients), with a follow-up of 5 years for all patients. Bone metastases were detected equally often in the clodronate group (29 patients) and the control group (24 patients) (P = 0.27), the development of non-skeletal recurrence was significantly higher in the clodronate group (60 patients versus 36 patients; P = 0.0007) and, most importantly, the overall survival was significantly lower in the clodronate group (70% versus 83%; P = 0.009). Identifying a definite adjuvant role for bisphosphonates will therefore require further large, randomised studies to resolve these and other issues. Until the results of further trials that are currently under way with zoledronic acid, clodronate and ibandronate are available, the routine use of bisphosphonates in the adjuvant setting outside of research trials is not currently recommended except for prevention or treatment of osteoporosis. There is now a much greater appreciation of the benefits of active management of metastatic bone disease and the options for doing so. Indeed, the success of bisphosphonates has focused attention on the mechanisms of the control of bone metabolism in cancer and this is leading to a search for new agents that might act as osteoclast inhibitors. One promising compound is osteoprotegerin, which is a member of the tumour necrosis factor receptor super family and is a natural inhibitor of osteoclast production and activity. Osteoprotegerin acts as a decoy receptor, binding with osteoprotegerin ligand (the natural stimulator of osteoclast maturation) produced by the osteoblast . Very recent studies in mice have shown that osteoprote-gerin halted further bone damage and diminished the skeletal pain associated with tumour-induced bone destruction . A synthetic preparation showed promising effects on bone resorption in normal volunteer testing (Amgen data on file). If this promise is confirmed by phase I clinical trials in cancer patients that are currently under way, this long-acting, subcutaneous preparation could have an important therapeutic role in the future. Bisphosphonates have now been accepted as the treatment of choice in hypercalcaemia of malignancy and have an important role in reducing skeletal-related events, in reducing bone pain and in associated analgesic use, as well as improving quality of life. Bisphosphonates should therefore now be considered as standard treatment in metastatic bone disease from breast cancer. Further research is needed to determine the best time to start treatment, but once treatment has commenced it should be continued for as long as the skeleton is the dominant site of metastasis. The future may see further developments in the range of bisphosphonates available as well as the use of biochemical markers to tailor treatment to individual patients.